We have recently celebrated the International Women’s Day, but in my opinion, just celebrating this special day for women doesn’t solve any problem. But, talking to inspiring ladies and writing about them regularly can make a difference. 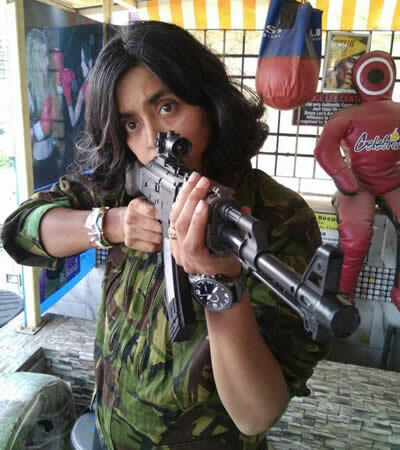 I met a wonderful woman by the name of Dr. Seema Rao: She is the only woman Commando Trainer in India. 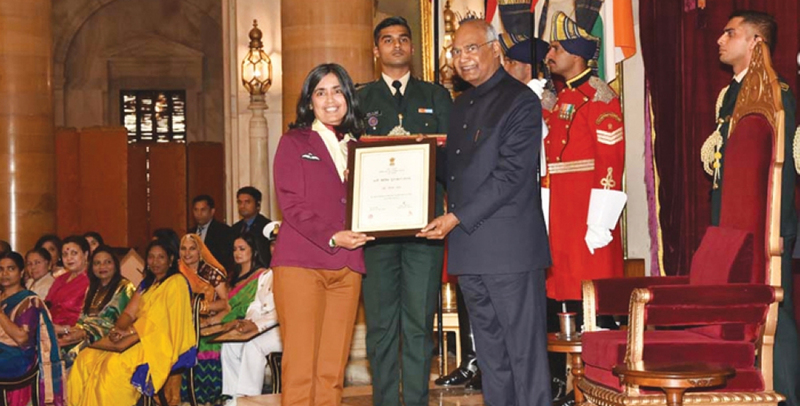 Dr. Seema has been conferred the country’s highest civilian honor for women, “Nari Shakti Puruskar,” by the President of India on this International Women’s Day. Tell us about your journey as a commando trainer. It was not my life desire to become a Commando Trainer. You sometimes start at one place and destiny takes you somewhere else. I wanted to become a doctor but ended up training commandos. It just happened. My Husband Major Deepak Rao and I started with training Pune police, then Mumbai Police. When Mumbai CP Tyagiji went to NSG, he invited us to train Black Cats. During that time, we met the Army Chief and then we trained at Para Regimental Training Center. We are recipients of three Army Chief citations, as we have contributed to train for 20 years 15,000 soldiers in CQB. We trained every elite Indian force including Indian Para Special forces, Commando wing, Corps battle schools, Academies & Regt centers, Navy MARCOS marine Commandos, NSG Black cat, Air Force GARUD, ITBP, Paramilitary, Police units. I kept improvising and pushing myself to be worthy of the profession. Every day was a challenge. I channeled my fear into action. The more difficult and impossible the task, the harder were my efforts. It was not easy equipping myself with these skills. It needed dedication and a deep desire to absorb and learn all that was necessary. I specialize in Close Quarter Battle (CQB), which is the art of commando warfare. It involves unarmed combat, armed combat, reflex shooting, team-on-team tactics and CQB simulation commando exercises. As a woman, I was thrilled about the life of commandos. In Martial Arts, I had learned to relish the adrenaline of getting hit if you don’t hit first. As a Commando Trainer, apart from the skills and training required, you need to be exposed and comfortable with challenges of different environment terrain and climatic conditions. So, I followed professional courses in sailing and yatchmanship, scuba diving, mountaineering and a skydiving course. I was also equipped with knowledge of the human body and medicine. You participated in Mrs. India World beauty pageant and also produced a movie as well as wrote a few books. How did that happen? I have done a lot of things but my fidelity and focus have always been my work in close quarter battle for the Forces. I believe life is once and in a lifetime, if you can experience different colors of life then it's a life well lived. I have been very passionate about women empowerment. So, I decided to produce a movie ‘Hathapayi’, which is my Mixed Martial Arts movie based on the mythological epic ‘Mahabharata’ where a woman fights back to regain her dignity. It is female oriented movie. It glorifies womanhood. The movie also received the Jury Appreciation Certificate at Dadasaheb Phalke Film festival. When the Mrs. India pageant was introduced, my friends coaxed me to participate. I went for the elimination round and was pleasantly surprised when I was selected. I was a runner up in the pageant. MD, MBA, PhD, what’s next what for Seema? Currently, I am conducting some research and in the process of writing one more book called ‘Balidaan’ for the use of the Forces. Why you don’t accept compensation for your training? My father was a freedom fighter. I grew up listening to my father's stories of his participation in the freedom struggle. I know money is important for being comfortable in life but for me, honor and duty have been more important. What is your message for the common girls facing all kind of challenges on streets, home or work? Don't be afraid. Fear is natural. You must learn to not succumb to it but harness it. Challenges are a part of life. Learn to override them. Assert your rights. Dream of the impossible and get started to reaching there. You have been bullied in school, and bullying is the major problem today in Mauritian schools. How a student can tackle this issue? You have two options, be comfortable with it and the second option is to fight back. It also depends on the extent of bullying. Take your teachers and parents into confidence. I learnt self-defense because I wanted to change the equation and feel in control rather than feeling helpless. When I was 18 years old, I was attacked by three rag pickers on the street. I had been learning Martial Arts for a year then. I threw my first punch on one of them. 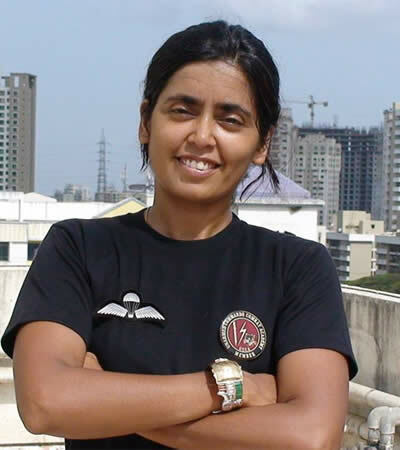 How do you feel being the only woman commando trainer of India? The media has christened me with several names. Wonder woman, Iron woman and so on. But I like this title, ‘India’s first and only Commando trainer’. Scuba diving and sky diving are your hobbies. Have you ever been to Mauritius, the paradise of adventure sports? Would you love to visit the island in future? I have been to Mauritius once and loved the sheer beauty of the sea. However, I did not have the time to scuba dive there. If an opportunity arises, I would surely visit the beautiful place again. Till then, more power to all Mauritian ladies.